I've officially begun my search for new wheels! I stopped by My Dutch Bike this week to say a quick hello to Soraya. What better time to start test riding bikes than the present, I said to myself. I noticed that most of Soraya's bikes had suspension seat posts, which is what my Motobécane lacks and probably what caused me most of my tailbone issues. The first bike I selected to test out was the Gazelle Chamonix. Watch the video to check out all its features. What drew me in was the sporty look slapped onto a Dutch bicycle. Priced at $1,500, the bike might be out of reach for me, but with all the ergonomic features, I also believe it could be a good investment. The Chamonix also has front fork suspension for added comfort over the bumpy SF streets. Furthermore, this bike not only has that European look, but offers the stylish cyclist a chain and skirt guard to protect your clothing from ruin. I took the Chamonix for a spin around the block. I intentionally rode over bumps so I could feel the impact on my tailbone. The verdict? Way better! This bike offers a smooth ride over potholes, manholes, train tracks and any other kind of uneven pavement. I missed the feeling of sitting directly on my sit bones that I get on my Specialized Ariel saddle though. I didn't test out the adjustable handlebars yet, because I wasn't aware they existed until I watched the video. There are 8 gears so that would make it easy to attack the SF hills on the Chamonix. In the long run I might be looking for a ride that's a bit more sporty than a Dutch bicycle so I can bolt around The City, but I plan to go back and give it a longer spin around downtown and test those handlebar positions, and also check out Soraya's Workcycles, a sturdier and heavier model that would certainly turn heads. The German Retrovelo models she has in the shop are pretty badass and worth checking out too. I was just at My Dutch Bike last week while visiting SF, just to look at the Workcycles Oma. The Friday traffic was horrible so I didn't feel comfortable testing it on an unfamiliar street. Please let us know if you test ride the Oma. I'm interested in how it handles hills. Will do! I didn't have time to take the Chamonix up a hill, but I plan on that being part of all of my future test rides. I can't wait to see what you get. I'll try to fight back my new bike envy! It's always tough finding the right balance between price and utility. I started using a generator hub last fall, and it has simply been awesome not worrying about charging my lights through the winter (I commute by bike every day). So I highly recommend a bike with that feature, if you can stand to have it locked up on the mean streets of SF (I work in Mountain View, bike theft is relatively rare). Thanks for your feedback! I really like the generator hub idea. I tried out another bike with one recently... up next! In Chattanooga I've hanged with road bikers going uphill aboard an 8-speed Bianchi Milano to our mutual surprise. Good luck to your research! 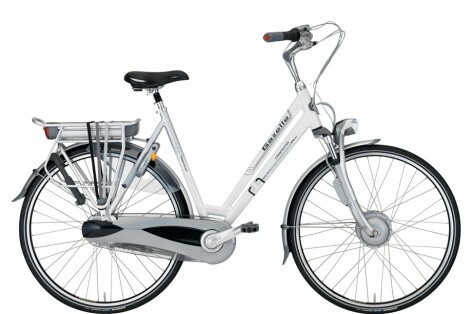 You know what - those Bianchi bikes are very good looking - and look quite functional for the city too.